A chiller is a heat-transfer device that uses mechanical refrigeration to remove heat from a process load and transfers the heat to the environment. Chillers are used by plastics processors when they need a lower process fluid temperature than a simpler system, such as a cooling tower, can provide. 3) it lowers the temperature of the coolant to the desired LWT, making it ready for re-circulation. 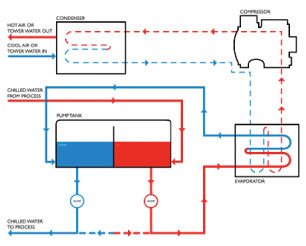 A chiller is a vapor compression mechanical refrigeration system that connects to the process water system through a device called an evaporator, as shown in Figure 1. The evaporator is a heat exchanger in which heat captured by the process coolant flow is transferred to the flow of refrigerant fluid. As the heat-transfer takes place, the refrigerant evaporates, changing from a low-pressure liquid into vapor, while the temperature of the process coolant is reduced down to the desired LWT. Next, the refrigerant flows to a compressor, which performs two functions. First, it removes refrigerant vapor from the evaporator and ensures that the pressure in the evaporator refrigerant line (vapor pressure) remains low enough to absorb process heat at the correct rate. Second, it raises the pressure in outgoing refrigerant vapor to ensure that its temperature is high enough to release its heat when it reaches the condenser, where the refrigerant returns to a liquid state. The latent heat given up as the refrigerant changes from vapor to liquid is carried away to the environment in a cooling medium, either water or air. Thus, there are two types of cooling condensers offered on most portable and central chillers: air-cooled and water-cooled.